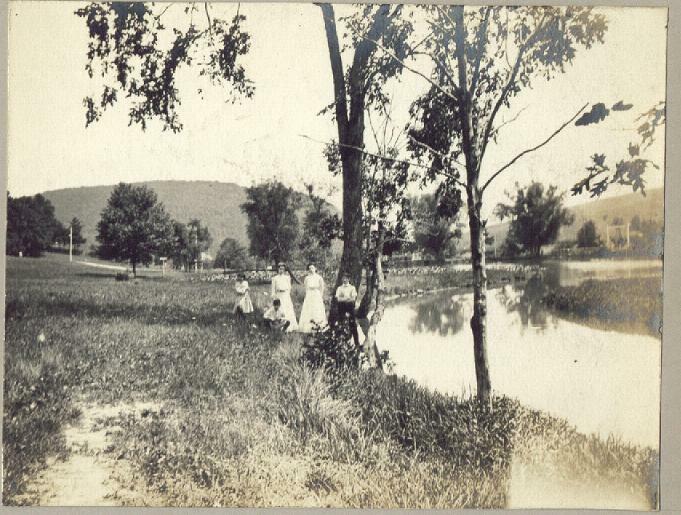 Comments: Summer Shenandoah (Nee: ) | Shenandoah Pa United States | c1900 | Comments: By the Stream- a c1900 photo album .I was told that many of the photos in this album were taken in - Shenandoah, Pa anthracite coal region . The physcial album itself was originally purchased from one N.M Wonders of Pottsville.Pa .There is a sticker on the - inside cover stating this. There is only one name that I can find “ Miss Christian” . a couple of words * Thanksgiving* * New Years * ,*View Tumbling Run* and the letters *S S P*. The people in the photos ,about 70 photos, are limited to several young adults and about 5 adolesants over what I’m guessing is a years worth of photo taking ,, theres 11 photos of a pararde in a town that has a “Sweeneys Cafe” . Some of the crowd are holding a Banner that has “Shenandoah “ written across it . Theres many seasonal photos ... and they are beautiful... The photos I’ve grouped as * Parade* *Spring* * Summer* *Winter* - If you want to see just one particular Group of photos type SHENANDOAH in the Surname slot then the group type( Parade,Spring etc ) in the First name slot - Type SHENANDOAH in the surname slot and this will bring up the photos . - Please let me know if you can recognize the locations depicitated in the images ... or any of the indivduals .